Observations and Surmisals : "Sundown Towns"
We were driving north toward Bayfield, Wisconsin, where we had never been before, though some of us had lived in south-central Wisconsin for (could it be?) twelve years. We had passed the exit for Oshkosh, at the edge of Lake Winnebago—names familiar to me from Oshkosh overalls and the Winnebago RV. Do they make Oshkosh B’gosh overalls in Oshkosh? Yes they do!, since 1895. Did they make Winnebagos in Winnebago? Sadly, no. They made Winnebagos in Forest City, Iowa. As we approached Appleton, our minds drew a blank. Appleton was named after Samuel Appleton, who never once stepped foot in Wisconsin. The very first hydro-electric station in the United States powered Appleton’s prolific paper mills. In 1886, Appleton operated the first commercially successful electric streetcar company. The first telephone in Wisconsin was in Appleton. The first incandescent lights in any city outside of the East Coast? Appleton. From approximately 1930 to 1970, Appleton was a sundown town. Black people were not allowed to be in Appleton after sundown. I paused and read the sentence a second and then a third time, slowly absorbing this information. Sundown towns (or sunset towns or gray towns) are all-white municipalities or neighborhoods in the United States that practice a form of segregation by enforcing a policy (explicit or implicit) of racial exclusion. In some places, a sign was posted at the town line that warned "colored people" to leave by sundown. Elsewhere, the policy was not so obvious; it was left to Midwestern discretion, a character perfectly suited to behind-the-scenes politics, to use back channels to implement a tacit policy of racial exclusion--quietly, so as not to draw attention from disapproving outsiders (and even some pious local finger-waggers, who best be kept in the dark about this one). I read aloud to our driver, who was French, about sundown towns from Wikipedia, where a footnote referenced Sundown Towns: A Hidden Dimension of American Racism, by James Loewen, as well as James Loewen's website. We fell into an aghast reflective silence. The mind boggled. "Lots of French fur traders up here," I reminded the driver. Because, honestly, it was shameful enough to have Trump in the White House; now I had to own this, too? Not by myself. "I was just thinking that," he said, kindly sharing the burden of my white American shame. On the website by James Loewen, I found a list of known or suspected sundown towns in Wisconsin. "Is...?" the driver stopped in his words. "Yes," I said. My town was on the list, as unconfirmed. Which meant that Loewen could reasonably infer from the census that it had been a sundown town. Not a single black family had lived there up until the 1970s. Bayfield was on the list. And Ashfield, where the five of us would stay for the next three nights. 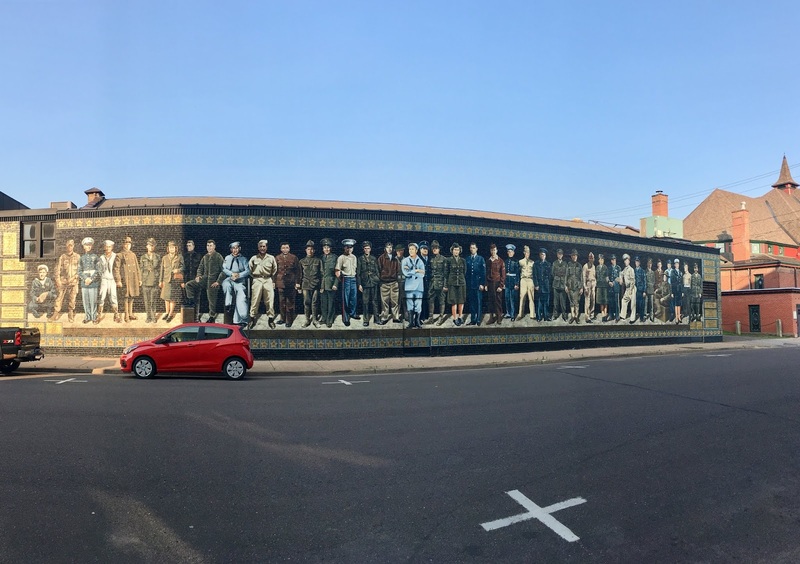 With streets lined primarily by empty storefronts and consignment shops, we were cheerfully surprised to discover something unexpected: On every block, around every corner, there were murals. They were colorful and vibrant and well cared for; a nostalgic look back through a sentimental lens at Ashland's halcyon years: the Thirties and Forties, by the look of the cars, and also the Fifties or early Sixties, by the look of the women's clothes and bathing suits (in one homage to sirens who were old ladies now). Bus tours of Ashland's murals were on offer, but we didn't take the tour. We dashed along from block to block, peeping around corners and clicking our cellphone-cameras as the setting sun bathed the east-facing murals in golden light, leaving the west-facing murals entirely in shadow.